I thought that might be a City thing – thanks for forwarding my observation. Early in the process I asked you take my email address off the planned walk-about meeting list. My situation has changed, please add me to that list once again. Another observation that I noted around the area (also City Transportation, but related to the construction) is the intersection of Moseley and Eastern. I noted that there is a missing Stop Sign at the corner for motorists turning onto Eastern. There is a Stop Line there – but no Stop Sign! From what I observed during about half an hour at that corner – people are exiting off Lake Shore and using the parking lot of FreshCo as a roadway – then exiting the parking lot onto Moseley, and then onto Eastern. This stretch of Eastern is very dangerous particularly for pedestrians because of the chicane and the design of Eastern Avenue, which encourages very high rates of speed approaching from the west. Many people in the immediate neighbourhood walk over to the shopping plaza and back. The missing Stop Sign must add to the confusion at an already confusing intersection of Moseley, the Plaza entrance, and the short spur leading to Eastern. I understand that this is not a TTC issue – but the construction is making a dangerous situation there, more so – because of the increased volumes as I explained above. The only thing that I can think of that might make the situation safer is somehow calming traffic on eastern from the west. Perhaps adding construction buoys to the street and big orange signs warning about the dangerous intersection coming up. 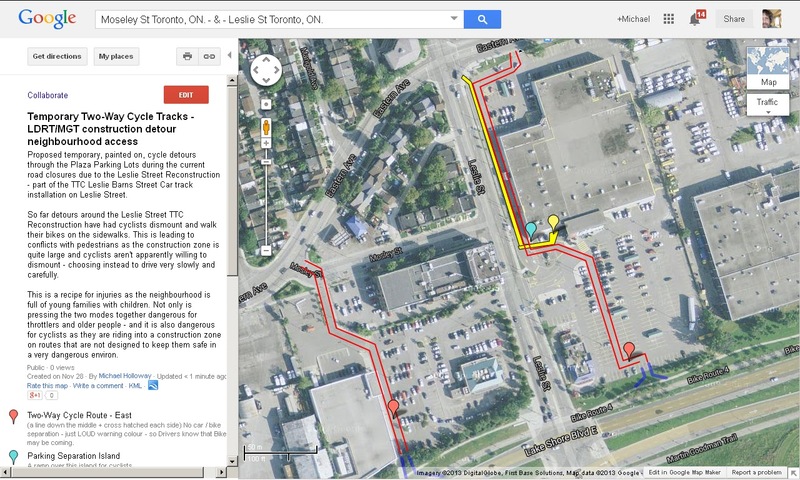 2) Cyclists finding it difficult to go north/south from LDRT/MGT into and out of, the neighbourhood. The only thing I can think of, is making the west side of Loblaws roadway a cycle track and creating (with construction buoys?) a separated path from the car traffic across Leslie to the FreshCo lot. I understand that Loblaws would have to do this. And it would mean that cars would be restricted to using the east-side roadway – that is also used for transport truck deliveries to the store. I happened to notice a shift change at Loblaws while I was there – and I watched staff using the west side roadway as a sidewalk to get up to transit services on Queen in order to go to, and from work (the east-side sidewalk on Leslie is closed, and blocked). Closing this west-side Loblaws roadway to car traffic would thus do triple duty – protecting cyclist egress into the neighbourhood; protect pedestrian staff traffic; and protect pedestrian Customers using the south entrance to the store (for unknown reasons). Previous Post C.I.P. wants to know YOUR Suggested On-street Routes and Informal Connections!